Presta's Super Cut Compound is by far the easiest and best product I have used on gelcoat ever. It can take a boat that has been neglected and oxidized to a shine that people can't believe. 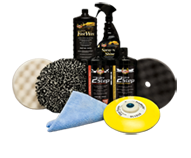 Finishes clean and creates a great platform to finish up with polish and wax.